The blog title is a line from a Michael McDonald song, but this post is not about Mr. Soulful Voice - it's all about Sweet Freedom, an awesome cookbook by the very talented Ms. Ricki Heller from the blog Diet, Dessert and Dogs. This isn't really a cookbook review; instead, it's more like a showcase of a few of the fabulous recipes that I have tried and loved. Writing cookbook reviews makes me feel like a snob. I didn't make all these treats since my last post, I've been collecting them for a while. What do you think I am, a big glutton? Maybe a little glutton! 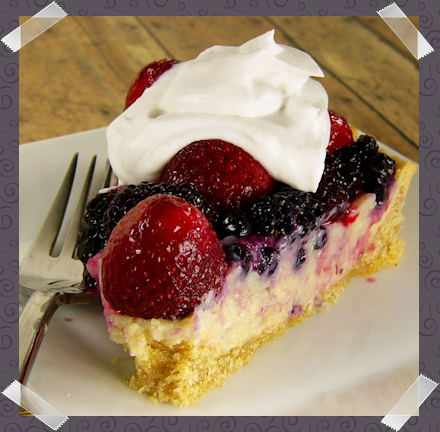 Let's start with my favorite: the Berries and Cream Tart! We had mini ones instead of one big tart. They are so good I could have them every day! The recipe calls for fresh mixed berries, but all we had were frozen berries which worked wonderfully anyway. The thawed berries were extra juicy, and the juice began to fraternize with the smooth Pastry Cream filling which made every bite downright heavenly. Soy Free, Sugar Free Coconut Whipped Cream! Words cannot even begin to describe how good this stuff is. Oh wait, yes they can - amazing, delicious, divine, stellar, exquisite, yummy, gimme gimme, nom nom nom! This is a fairly involved recipe, but the whippy deliciousness is totally worth the effort. I messed up a little because I thought it would be a good idea to keep it in the freezer while I took the photos of the tart. The fridge is plenty cold to keep it perfectly perfect though. However, if I hadn't done kept it in the freezer I never would have known how good it is slightly, barely frozen! My super photography lights started to make the cream soften on top of the tart as I took the pictures, which made it even better! Fake slice! I cut the mini tarts in thirds. Chocolate Satin Tarts. Oh, the richness! Oh, the smoothness! Oh, the chocolateness! They are a chocoholic's dream come true and I never want to wake up from it. The ganache filling was so easy to make it was ridiculous. Something so good should take lots of effort and be incredibly time consuming. Not that I'm complaining. I had mine with a scoop of vanilla ice cream on top. I should have taken the picture before the ice-cream gluttony impulse, but c'est la vie. 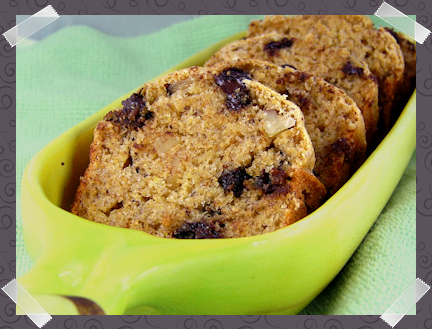 Next up are the Banana Chocolate Chip Mini-Loaves. Ricki, you had me at mini-loaves! I have a thing for tiny breads, just like I prefer cupcakes to cakes, I'll take mini-loaves over a big one any day. These were amazing, and I'm not usually a big banana-in-baked-goodies fan. You can substitute nuts or sunflower seeds for the chocolate chips, so I used half chocolate chips and half chopped walnuts. Do you like Mr. Wing-It's banana split dish? Very appropriate for this picture, I thought. 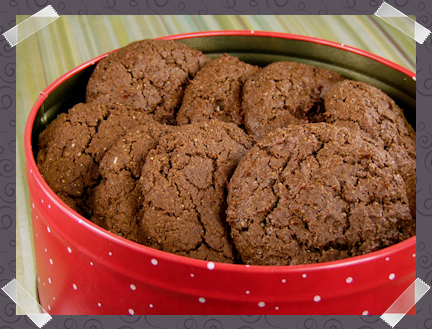 And last but not least are the Chocolate Peanut Butter Fudgies of love. They were a breeze to make and they are so so good! I forgot to add chunky peanut butter to our shopping list and all I had was the creamy kind, but I figured it would be just fine to shell some peanuts (we always have peanuts for the squirrels and the Blue Jays), chop them up a little and add them to the dough. Sure, that would have worked... had I remembered to add the chopped peanuts to the dough! Doh! What an airhead! They were delicious even with the smooth peanut butter. I wanted to bake and photograph the Ultra Fudgy Brownies too, but my tummy hasn't felt too happy these past few days. There's always next time! I've made a TON of Sweet Freedom treats (having been fortunate enough to be a tester for the book) and you still managed to showcase recipes that I haven't tried! Except for the amazing coconut whipped cream, that is. I ate it with a spoon. ;) I'm so happy you're enjoying the book! Yikes. If I didn't already own this cookbook I'd be in a sugar(-less) rush to get a copy ASAP. 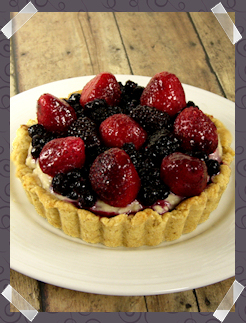 The berry tart looks amazing as does everything else. I'm somewhat addicted to the blondies but you've convinced me it's time to move on. so much yummmmminess! mmmmmmmmmmmmmm! i can't believe i don't have ricki's cookbook yet - it's on my christmas wishlist though! yay! the tart, those mini-loaves, the whipped topping, and the fudgies all look most excellent, River! sweet freedom & sweet awesomeness! Oh wow. I do LOVE this book, but I haven't tried either of those tarts yet, and I am supremely jealous that I don't have any waiting for me right now. Must get on that. 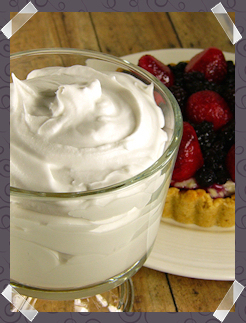 Vegyogini - I could SO eat the coconut whipped cream with a spoon! You're so lucky to have been a tester for this awesomeness! Liz - Isn't it fantabulous? I dare anybody not to love it! Andrea - I haven't made the blondies yet, but now that you mentioned you're addicted to them I must bump them up to the top of my future-baking list! Jessy - I hope you get it!! You will definitely love it! Gina - You must make those tarts! They are the bomb! OK, who says "the bomb" anymore? Jes - You should enter all the giveaways and maybe you will get lucky! Check Ricki's website, there's a link to a giveaway right on the front page! You had me at "Sweet"! You present the food so nicely, and take such lovely looking pictures, you could sell any cook book to me! I would totally make any of those desserts, especially the chocolate satin tart! Yum...I'm gonna check out that book. I licked the screen a little bit. It all looks wonderful and you used the word fantabulous! Hee hee hee. Yum! I think I just drooled on the keyboard. And yes Mr McDonald is awesome. But these treats are even better. That whipped cream! THAT WHIPPED CREAM! Geez, I need to own this. Ricki - You're very welcome! How could I not have an all Sweet Freedom post? The chocolate ganache filling would make awesome candy! You're eeeevil! Jess - Good choice! You can't go wrong with chocolate! 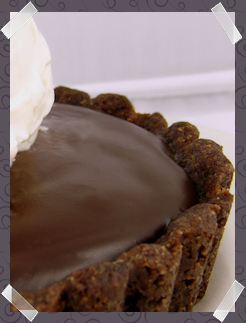 Those tarts are extremely chocolicious! Mo - I knew I wanted this book back when Ricki blogged about the whipped cream even before the book was published! It's beyond amazing! why don't i have that book yet!!?? that whippy cream looks so damn good!! at an awesome review, River! Your pictures are so gorgeous. What a gorgeous fruit tart & I'm dying to try that whipped cream! Mihl - Thank you! I tried to take decent pictures to do the book justice, though I am never totally happy with the photos that I take. Ooooohhh... scrumptious! I'm on call at the clinic right now and looking at that much delicious sweet goodies is giving me some serious dessert cravings! Sadly, nothing to make any dessert with! I have missed you - somehow I did not make the transition to your new blog! But I saw your comment on Krys's and followed it, and here you are. Wow, I might have to buy Ricki's book just for that whipped cream. It's beginning to look a lot like Festivus around here! I ♥ the new snowy header! The berry tart and the chocolate tart are calling my name!! !